You call to set the appointment and are put on hold until you finally just end the call and try again later. You call to set the appointment and the person with whom you’d like to speak is busy and can’t take your call. You leave a message for the busy party and never hear back, meaning you have to call again, hoping to catch the person when they aren’t busy. You set the appointment and due to a mistake by you or the other party you show up on the wrong day. You wind-up playing the always enjoyable game of phone tag. The other party says, “Sure, just give me a time that works for you,” and every opening you have, they’re booked. Plus, this goes both ways. You could be the vendor and experience no-shows, costing you money. Your customer comes on the wrong day or time causing both parties frustration. You accidentally double-book yourself, make a customer angry, and lose them to the competition. Again, I think you get the point. 40% of customers prefer self-service over human contact for future contact with companies, and 70% expect company websites to have self-service options. An inefficient appointment booking process can be a source of annoyance for your customers and negatively impact your business. A recent Accenture Survey indicated 85% of customers are frustrated with a company that does not make it easy to do business with them. And, more than half (51%) switched to competitors due to poor customer service experiences. But Wait, There is Microsoft Bookings! Microsoft Bookings is a self-service option that makes appointment setting a breeze for both your customers and you. Bookings helps a business create a web-based calendar booking page your customers can access at their convenience. They can check available times, select a service with the appropriate staff, and book an appointment in just a few clicks. Once a booking is made, your customers and staff receive automated email confirmations, reminders, and even notifications of rescheduled and cancelled appointments. Customers can set their appointment online 24/7 and once their finished they’ll receive a calendar invite that they can easily add to their own personal calendar. If a customer still prefers calling your office, it’s no problem. Just manually enter the appointment into Bookings and customers will still receive email appointment confirmations and reminders. Bookings is turned on by default for customers who have the Office 365 Business Premium, or Office 365 Education A3 and A5 subscriptions. Bookings is also available to customers who have Office 365 Enterprise E3 and E5, but it is turned off by default. And, here is the best part: There is no additional cost to use Microsoft Bookings! To turn it on, see Get access to the Office 365 business apps for enterprise subscriptions. Another decision to make is whether to consider a more elaborate tool. Bookings doesn’t provide many extras – just the custom fields you can add to the scheduler. A far more advanced tool, such as Square Appointments, costs $30 per month for one user, but if you add more seats, it can increase to $50 per user or more per month. MindBody is another more advanced option, but pricing tends to be even higher as the feature set increases. With Bookings, there is an app for iOS and Android, and the interface is clear and user-friendly, but it’s not a high-end app. Square Appointments and MindBody, for example, both let you add an e-commerce component to sell products as part of the scheduling process. However, Bookings is likely the best fit for a company that needs simple scheduling without the fuss, and customers won’t have to figure out advanced features. Bookings is turned on by default for customers who have the Office 365 Business Premium, or Office 365 Education A3 and A5 subscriptions. Bookings is also available to customers who have Office 365 Enterprise E3 and E5, but it is turned off by default. To turn it on, see Get access to the Office 365 business apps for enterprise subscriptions. Enter your business information. This includes your business name, address, phone number, website, logo, and business hours. Your company name and logo will appear at the top of your bookings page and the rest of the information will be at the very bottom. You’ll also want to set the email address you want to share with your customers on your booking page and where email replies to booking confirmations and reminders should be forwarded. This is also where you’ll set your business hours. By default, the business hours are 8 a.m. to 5 p.m., Monday through Friday. Just select the drop downs to change the business hours if needed. Set your scheduling policies. Not all appointments are the same. Some take only a few minutes, while others can take hours or more. In Microsoft Bookings, the Booking page is where you set the scheduling policies for your business. Scheduling policies include the length of appointments, acceptable lead and cancellation times, and automatic notifications of booking changes. Define your service offerings. When you define your service offerings in Microsoft Bookings, you set, among other things, a service name, description, location, duration, default reminders to customers and staff, internal notes about the service, and pricing. You can also tag the employees who are qualified to provide the service. Then, when customers come to your business web site to book an appointment, they can see exactly what types of appointments are available and how much their service will cost. They can also choose the person who they want to provide the service. Create your staff list. The Staff page in the Microsoft Bookings app is where you create your staffing list and manage staff member details such as name, phone number, and email address. You can also set working hours for each staff member from this part of the app. While Bookings is a feature of Office 365, not all your staff members are required to have an Office 365 account. They just need to have a valid email address to ensure they receive bookings and schedule changes. Set employee working hours. It’s important to set your staff members working hours so their availability is accurately represented when your customers try to book them. By default, the working hours for all your employees are set to the match the business hours you previously established for your company. You can easily customize each employees work hours and days off if necessary. Schedule business closures, time off, and vacation time. Occasionally, you’ll want to close your business for holidays or team events, and your employees will need time off when they’re sick, on vacation, or unavailable for other reasons. You can schedule time off from the Microsoft Bookings calendar, and the employee will be unavailable for bookings during the specified time. Once the business reopens or employees return to work, everyone will be listed on the booking page according to their established work hours. Publish or unpublish your booking page. 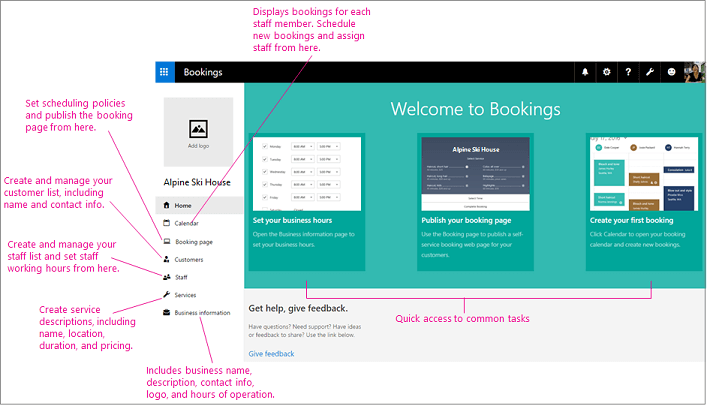 Simply use the Booking page tab in the Microsoft Bookings app to publish and unpublish your page. Create and staff your bookings. Bookings can be scheduled and staffed in two different ways. The first way is by the customer using a standalone booking page or an embedded booking page that you integrate into your website. The other way is for you or one of your employees to enter the bookings manually, such as when a customer calls for an appointment, for example, rather than requesting one through your web site. Business owners can’t afford be tied to their desks. If you need to make or reschedule an appointment while away, Microsoft Bookings includes a mobile app that offers you and your staff flexibility, convenience, and control. You’ll have full access to your scheduling calendar and booking details wherever you are, the ability to manually book appointments through the app to capture customer requests while on-the-go, and quick access to email, call, or text customers when needed. With the ability to book clients’ next appointments from their office or home while providing a service, you can also boost your sales by easily enabling repeat business. As a small-business owner, it makes zero sense to abstain from collecting customer information, one of the most valuable resources inherent to scheduling services. Whether it’s entered manually or through the scheduling portal, contact information is automatically synced with your business’s contacts database, a very clever feature built into the software. So, now it’s your turn. Set up your own Bookings site and take the headache out of setting and managing appointments. If your current IT provider doesn’t have the time or desire to help you, give us call. We’d be happy to help your personalize your own Bookings site. Our customers have been delighted with its ease of use, and we’ve been equally delighted to have taken the time-consuming job of scheduling off our staff member’s to-do lists. To get you started, take a look at the Matrixforce Bookings site.